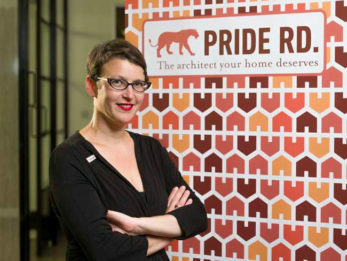 In recent months and weeks, our director Lisa Raynes has been giving talks across the length and breadth of the country on her architecture franchise model, and how experienced architects can join it. She has also fielded questions from potential clients about the workshop process. Here are her answers…..
Have you had criticism from other architects? No, the industry in general have embraced the idea with open arms, they see the value in helping female architects to stay in the profession. I often get asked however if men are excluded… (See response below). Can men join the architectural franchise? Yes of course men can join us, and I have had enquiries from men. The idea of the franchise is to help marginalised architects, those who want a better work life balance, and those who have struggled to set up on their own. Men too face similar issues to women and we’re here for them too. Do I think about projects after hours? Yes, but mainly I’m focused on the business and how to constantly improve it, things that can help streamline the business, and make us more efficient, so we can spend more creative time with clients. We all carry are own Professional Indemnity insurance. My franchisees trade as Pride Road (within a specified territory), and retain PI in their original company name or as a sole trader, trading as. Our technical associates carry their own PI too. Everyone’s professional indemnity cover is checked by Pride Road HQ annually. When will you become a franchisor? When I have 5 franchisees I will be able to sell my territory and spend all my time as a franchisor…. I will effectively become a trainer and a manager. Do you do cost plans in house? Not at the moment, we outsource these to our Quantity Surveyor partners. How much does it cost to join Pride Road? To join the architectural franchise, the initial licence costs £8,950 for a 5 year period. There is a monthly marketing levy on top, and we take a percentage of turnover. Ask for a prospectus to find out more. Don’t franchises have a bad reputation? On the contrary, over 90% of franchises succeed after 5 years. The franchise business model is well respected by banks, and you can get loans for up to 70% of the franchise fee, plus working capital to cover the set up. Loans are not available for normal start ups. How do you help non-architects, such as clients, understand plans, sections and elevations? In our concept design workshop, once I’ve drawn the existing layout, I test the clients to describe rooms and where we’re located on the plan. I ask all the parties sat round the table and ensure no one is left out, if someone is struggling, I will work hard to make sure they understand. Sometimes we physically show physical features, by walking around the house with the plans. What are the minimum qualifications to join Pride Road? Do you have to be a fully qualified architect? Yes, you have to be a fully qualified architect with at least 3 years post part 1 experience. Passing the RIBA part 3 examinations proves a professional rigour, determination, persistence and intellectual quality. The completed PDAs prove 2 years of end to end project experience. How do you maintain the quality of the build if you’re not involved beyond building regulations? We recommend that clients use a main contractor as a single point of contact. We can put forward independent project managers if our clients need the reassurance. We can also suggest builders, who we have worked with regularly, following feedback from clients on previous jobs. Our technical team are on hand if there are particular site issues, but we won’t hand hold the builders on site. Any tips for balancing work and family life? List everything out you have to do… Ranging from job tasks, marketing tasks to financial and family tasks, and work out what is the most important thing to do. If you could only do one thing that day that would improve your business, what would it be? Do that first. Then do the other important urgent stuff. The important urgent stuff will always get done. Try and delegate the non important urgent stuff- or do it at a time to suit you, not other people. If you’re interested in starting your own architectural practice with Pride Road, you can apply here. To learn more about how it works, click here. You can get updates from Lisa via her personal Twitter account, here.